The current evidence on cannabis and cerebral palsy is very promising. Over 17 million people worldwide have cerebral palsy, and it is the most common physical disability in childhood. It’s estimated that 8,000 to 10,000 are born each year in the United States with this condition. What is it exactly? Cerebral palsy is an incurable disorder characterized by disruptions between the brain and muscles. These disruptions can range from mild to severe but are characterized by difficulties in movement, speech, posture, and coordination. Current treatment options are costly. Medical expenses for children with cerebral palsy are ten times higher than average. The total lifetime costs to take care of a child with cerebral palsy exceed $1 million. Meanwhile, cannabis is showing profound capabilities in treating symptoms associated with the disorder. From reducing muscle spasms to providing pain relief, cannabis is proving to be a powerful (and natural) treatment option. Seizures are a common occurrence for individuals with cerebral palsy, particularly children. This is because CP deals with disruptions in the brain’s motor centers. While there is no single cause for cerebral palsy, it is now believed that it is likely caused by injury to the brain. Brain injuries increase the likelihood that abnormal activity will occur, often manifesting in the form of seizures. Seizures can vary in severity, including both generalized seizures and partial seizures. Generalized seizures involve electrical impulses throughout the entire brain while partial seizures only affect one area of the brain. It is important to note that not all individuals with CP will experience seizures. However, according to statistics from the National Institute of Neurological Disorders and Stroke, as many as half of all children with CP experience one or more seizures. Acute or chronic pain is a hallmark symptom associated with cerebral palsy. Commonly experienced in the hips, ankles, knees, and back – pain is a daily reality for many individuals with CP. Pain is often a result from spasticity, musculoskeletal malformations or even from sitting in a wheelchair throughout the day. For individuals with spastic cerebral palsy, the pain can be extreme. Cannabis is highly effective at reducing pain. 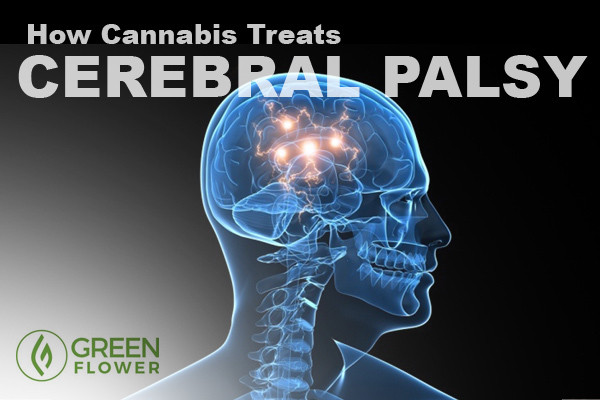 A study published in the American Journal of Physical Medicine and Rehabilitation revealed that of all the treatment options for treating chronic pain in patients with cerebral palsy, cannabis was the most effective. The study was one of the first of its kind to examine the effects of cannabis for pain relief in cerebral palsy patients. Unfortunately, federal restrictions have stunted the amount of research that has taken place. Given the profound results of this study, just imagine the implications if the medicinal applications of cannabis could be explored fully. Muscle spasms are not only painful, they’re debilitating. Spasticity can make movements difficult or in some cases nearly impossible. Even tasks such as walking can be severely impaired with muscle spasms. It is estimated that spasticity is present in 80% of cerebral palsy cases. There are numerous studies that have examined the effect of cannabis on muscle spasticity. A study involving the drug Sativex (a spray that contains THC and CBD at a 1:1 ratio) successfully reduced spasms in patients with multiple sclerosis. Another study in 2012 found that cannabis was a significantly better treatment for reducing spasticity and pain in MS than a placebo. So cannabis doesn’t just calm muscles spasms down; it reduces the pain associated with them. Although there is clearly a need for more research on the exact implications of cannabis for reducing spasticity in CP patients, the positive impact is evident. Especially given the successful results of cannabis for other neurodegenerative disorders like MS.
Did you know sleep issues are common for individuals with cerebral palsy? And this study is far from the only example. A study in 2013 published in Frontiers in Psychiatry found that Δ9THC not only stabilized autonomic output (autonomic nervous system) during sleep but also blocked serotonin-induced exacerbation (worsening) of sleep apnea. The researchers then went on to indicate that a man-made form of THC (dronabinol) improved sleep for individuals with sleep apnea. Although the studies regarding cannabis and cerebral palsy are few and far in-between, the positive impact is clear. Especially when we take into consideration how any potential side effects of cannabis pale into comparison of many pharmaceuticals on the market today. But as long as the U.S. government classifies cannabis as a schedule I drug, the same class as heroin, patients will continue to be deprived of a life-changing medicine.